“Garden rocket” is a cool-weather green that likes rich, moist soil. This variety has a mild peppery and nutty flavor. It is vigorous, germinates quickly and can be planted from early Spring to late Summer. Holds well through the winter. Great in salads and as a cooking green. A genovese-type basic with large aromatic leaves and a classic sweet basil taste. A tender annual that likes shelter and warmth. We start seeds in February and transplant to the greenhouse (or a sunny protected spot with warm night time soil temperatures) when plants have two sets of true leaves. Never water the leaves, and pinch off flower buds to promote maximum leaf growth. 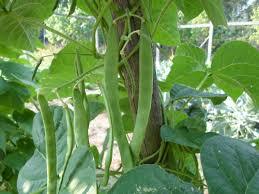 Growing Beans: A great source of year round protein from the garden. Here is how we grow all of our varieties: Direct-sow in May to mid June when the soil is 60 degrees. Plant seed 2-4 inches apart and 1 inch deep in rows that are 18-24 inches apart. Seed into moist warm soil but avoid irrigating until the starts have emerged. If the soil is too cool AND wet they will rot. Beans aren’t fond of water on their foliage, and we have a rule that we water at the roots and don’t handle beans when they are wet. We plant beans as the first crop in any new bed that we develop. I’m always tempted to put more compost on the beans but Steve discourages me…too much nitrogen results in more foliage and a poor pod set. The roots of these plants are shallow so be careful weeding as they can be damaged easily. Shallow roots also mean that watering should be regular during hot weather. Harvest: We allow the pods to dry on the vine to an almost leathery/papery stage. We will remove the bean seed from the pod and give it an extra drying on a screen (old window screens can be used) before storing in a sealed jar in a dry cool and dark place . A productive bush bean that produces a large, nutty tasting dry bean. It is a staple in the pantry. The plants are 12-18 inches high and produce more than a dozen pods for drying. Use in cooking when recipes call for a Black Turtle Bean. We have selected our seed stock for healthy, disease resistant high yielding plants. This early maturing, Roma-type pole bean has a deliciously rich, sweet flavor. The 8" long, 1" wide, flat green pods are stringless and stay tender for long periods. Extra vigorous in the seedling stage with strong vine growth. white seeds. Same growing instructions as our other beans. We allow many of the pods to mature and eat the rich whole beans fresh. We acquired a handful of this heirloom at an Organic Seed Alliance seed swap in 2008. It is prolific, growing 6-7 feet and producing maroon pods that hold dark blue beans that can be eaten as a snap bean or dried. The taste and cooking is similar to black beans. If you are looking for a productive pole bean this is perfect! Named for a site along the Delaware River, where it was grown by both Pennsylvania farmers and the Lenape natives. Steve’s brother has grown this bean in his SW Washington garden for years. It is THE most striking bean we offer...a black and white pattern that is so beautiful They are so beautiful that it is difficult to cook them. Art in a pod! It is not as dense as the black bean, but still as flavorful. The color fades dramatically when cooked...as with most white and black, it turns to grey. We have been working for four years on improving this crop for NW gardens. Original seed was a strain of Envy from Territorial Seed and we have selected for pods containing three peas. Boil whole pods and sprinkled with sea salt. We should all be planting more of these nutritious beans. The only source of organic edemame we have been able to find are grown in China. Help us grow local. Original organic seed from Ed Hume in 2010 because I prefer cooking and pickling this shape of beet. It is easier to peel, cut, shred, juice and can. The roots are sweet, tender and will last into the winter. Like other taproots, beets like a deep, moist and rich soil. You can sew beets as early as April. Plant about 1 seed per inch, about ½ inch deep in rows that are 12-16 inches apart. Thin to 4 inches apart. Will last into early winter. A rare open pollinated variety produces large sweet heads developed by Jim Myer at Oregon State University. Steve has worked with this seed for years, selecting the plants that have large sweet heads and resists bolting. Every year it gets better! We start our broccoli indoors in February. When the starts have solid roots, we harden them off, and transplant into the ground 12-24 inches apart. Keep the soil uniformly moist. After harvesting the first head, auxiliary buds will continue to produce smaller but just as tasty heads. For a late fall and early winter harvest, sow seeds in mid July. Plant the seeds ½ inch deep and keep the soil moist to help plants deal with the heat of late summer. Sprouting broccoli is planted in late summer and harvested in the spring. Don't pull up the plant, but allow it to winter over (it can tolerate moderate frosts). In the spring the plants will produce some of the first food from the garden: tender purple sprouts that can be eaten fresh or steamed. Plant seed 1/4” deep. Thin plants when they are 1” high to 8” apart. Celery likes a rich and continuously wet soil so it can draw up large amounts of water. We sow indoors in March in flats and transplant when the soil temperature is above 60 degrees, planting about 12 inches apart. Keep the plants well watered. Harvest by picking individual stalks as needed. This year our friend and farmer John Bellow grew out a variety with red stems that is crunchy and sweet. A great tasting cilantro. We plant in early spring and every two weeks for continuous supply of fresh leaves. Difficult to germinate in hot weather. Sow in shade and keep cool until seedlings have emerged. Great insectary plant as well if allowed to bloom. Aphid eating syrphid flies love it. Developed for its hardiness, earliness, and colorful display in the mountains of Montana. This heirloom field corn has moved to the Chimacum Valley and is grown for us by Linda Davis. Multicolor ears for grinding into flour, making hominy grits or for just decorating. 4-5 foot stalks with 6 inch cobs that will mature in our NW climate. I plant this mammoth dill in the greenhouse in the early spring and the seed heads are ready when the cucumbers have ripened. We stagger several plantings because both the greens and the seed head is edible. The foliage on this variety is a beautiful teal green, and the seed heads are large and can be used in pickling and in bouquets. The heads on dill will mature at different times, requiring that you watch the plant and harvest continuously. The heads will shatter seeds and self sow if you aren’t careful...or it’s just a great way to always have dill. This cold hardy Chicory is a staple winter green for us. The plant grows up to 12 inches across with braod thick outer leaves enclosing a head that has milder leaves. You can tie up the outer wrapper leaves and force a blanching and sweetening of the inner leaves in about 2-3 weeks. Sow seeds in the spring and again in mid July for fall and winter harvest. The bitterness of the leaves will be reduced by frosts, soaking in cold water or by cooking. Growing Kale: Kates are a cool weather crop that is a perfect match for a NW maritime climate. We plant twice, direct sowing in the spring and again in mid July for an over-wintering and early spring harvest. Plant seeds ½ inch deep 2 inches apart, thinning to 4 inches We always allow some of our kale go to flower and eat the tender shoots and petals. You gotta love kale for it’s cold hardiness and how the flavor gets better with frost. You can pick leaves from the bottom up and have a continuous source through the winter. Monitor leaves for aphids in cooler moist temperatures. Green Curly KALE Brassica oleracea. A large, tasty, thick leaved kale that is a vigorous and dependable. It is the closest kale we have to a collard...rich in color and cabbage taste. In fact, it will cross with your cabbages if you allow both to go to seed. The result can be some amazing “kabbages”. A highly savoyed kale with dark blue green leaves with a hearty, nutty flavor that maintains its firm texture when cooked. If I had one kale to pick it would be this one. It makes GREAT kale chips and has more recipes on line than any other kale. All that from a plant that grows into the winters in the Pacific Northwest. Similar to Red Russian Kale, this variety has purple veins with green leaves. Both the flavor and the color are rich. It is hardy in Pacific NW winters and improves its flavor with cool weather. It is a winter staple at Oatsplanter Farm...our favorite stir fry Kale. We sow seed indoors in flats starting in February, let them harden off by April and begin transplanting into the garden when they are about 4 inches tall. 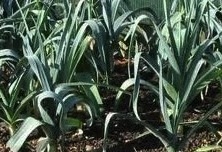 Leeks have shallow root systems and grow best when they are in well-drained, fertile soil with good moisture retention. We transplant our leeks 2 inches deep and about 6 inches apart. Leeks last through the winter in the ground and stay tender until the spring when they begin to bolt. Cut lengthwise and wash well before cooking, the tight leaves can hold soil. Growing lettuce: We start all our lettuce in flats indoors in mid March, sowing seed about 1/8 deep. It is a cool-season crop that grows best at 60-70 degrees. By April they can be transplanted into the garden. We will also direct-seed into the garden in March and April for a harvest of small salad greens as we thin. Mature heads of lettuce will need about 8 inches between plants. Try planting seed every three weeks until the temperatures are near 70 degrees. This will give you a continuous supply until the heat of summer closes the growing window. Lettuce likes full sun and average water. When they begin to bolt and go to seed, the leaves will become bitter…you’ll notice the white sap increase in the leaves this time of year. Our selection for this year is a butterhead lettuce we originally got from our friend Frank Morton of Wild Garden Seed Medium heads, tender leaves and a buttery texture. It has adapted well to our maritime climate and is the sweetest lettuce I’ve grow here. A classic romaine with dark green crisp leaves. What makes this romaine different is a touch of tenderness in the leaves from a butterhead influence. The heads grow to 10 inches, are tightly layered and very heat tolerant. This all season lettuce requires cool temperatures for germination. 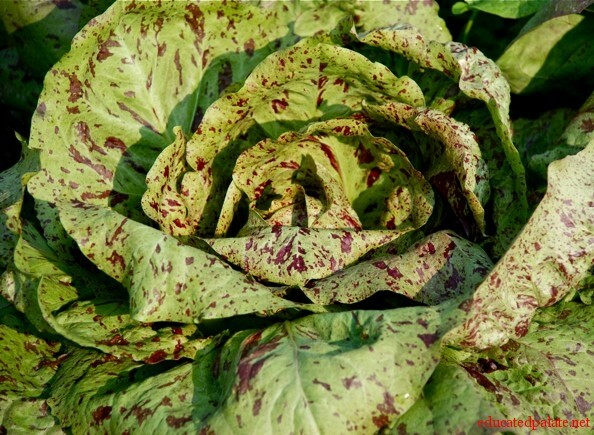 This red-tinged lettuce forms heads that can be 10 inches across. Tolerates cool soils so it can be sewn early and enjoyed in the spring. Direct seed after first frost, planting every 2-3 weeks until the heat of summer. Replant again in late summer/early fall. Will tolerate moderate frosts and provide greens into early winter. Great taste in this butterhead heirloom variety. This unique emerald and garnet leaf “mountain spinach” is excellent green for salads and cooking. It likes a rich soil and full sun, and can tolerate more warmth than spinach. The leaves are heart shaped and can be picked when the plant is young to eat fresh, or to steam/sauté as the plant matures. When mature it bears a flower stalk that is striking in bouquets. We direct-sow seeds the end of March and continue through mid June to stagger the harvest. We direct-seed in April. Like carrots, parsnips like deep soil and full sun. We plant seeds ½ inch deep and thin plants to 2-3 inches apart. They require a full season to grow, and their flavor improves with cooler temperatures. The sweetest roots can be dug after the fall frosts. Parsnips will over-winter, but in spring as the weather warms any parsnips left in the ground will become woody. 1 inch deep and 2 inches apart. Our trellis is 6 feet high to hold these climbers. The pods are sweet and crisp and at their peak when some seed development has occurred. They remain sweet as they fatten. For the pods that escape being eaten when they are smaller, you can allow them to get large enough for shelling. They become a bit too starchy for raw eating, but are wonderful blanched or steamed. Always use two hands when picking pea pods to keep the stalks from breaking. This hot pepper is a constant in our greenhouse each year. Vigorous in its growth and high yielding. We'll be picking peppers until Thanksgiving. Makes a dynamite pickled pepper. We start seeds in flats in February and transplant to the greenhouse with lots of compost and lots of sun in mid April when the soil temperature is about 60 degrees. Plants will grow to four feet and require staking. 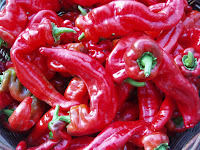 Sweet Nardello PEPPERS Capsicum spp. A sweet fleshy pepper that is our substitute for the classic bell. Crunchy, flavorful and prolific. Use fresh or dry for use during the winter months. We start seeds in flats in February and transplant to the greenhouse in mid April when the soil temperature is about 60 degrees. The naked lady found her way into our garden because we LOVE pumpkin seeds and needed a source outside of China. The pumpkins are 6-8 inches across, orange/green streaked and full of seeds. The flesh is thin and watery (you can’t have it all) and although I tried for years to cook with it, we now give the shell to our neighbors for animal feed. We start seeds in 4 inch pots inside. They are tricky to germinate because of being "naked". That requires that the soil be moist but not wet. We transplant into the garden when the soil temperatures are above 60 degrees. Vigorous growers with long and productive stems. Typically each plant bears about 4-5 fruits. Give them room to grow. We harvest when the leaves are drying and the fruit has become more orange than green. Remove and dry seeds. Store in refrigerator in a sealed container. Hanako and Marko have selected for winter hardiness in our region and resistance to bottom rot. Grows best when sown in early July for harvest in late fall and winter. Smaller plants will overwinter and produce good edible regrowth in the early spring. May also be grown for baby cut leaf production in the early Spring. Spinach likes a rich, cool, fertile soil with lots of organic matter. It grows best in the spring and fall. We direct sow the seed about ½ inch deep in a uniformly moist soil. We thin to 3 inches apart, using the baby greens for salads or steamed. This variety has thick, dark green and wrinkled (savoyed) leaves. We like the savoy trait…it gives more surface area to consume, but it can also be a good place for any pests to hide. I soak spinach leaves in basins of water and rinse at least twice before eating. Once the plant begins to bolt with the heat, the leaves will become tough. Replant in mid July for a fall harvest. If the plants are “teacup” size going into the winter frosts they have a higher chance of surviving through the freezes into the spring for early harvesting. We originally got our seed from our neighbors Jim and Joyce who had brought the seed from Whidbey Island. This unique, regional heirloom squash was grown by farmer Edwin Sherman who first planted this squash during the Great Depression. It combines the traditional blue Hubbard with a Sweetmeat squash...sweet, dense, flavorful. The skin is a blue-gray, and the flesh is golden and moist. A great keeper, storing up to 1 year. Vigorous 10 foot vines produce 4-5 squash, each weighing 10-15 pounds. The Sherman family worked with WSU to further develope the seed stack and keep the strain in existance. Nominated for the Ark of Taste, it is a squash rich in regional history. Read this article from Edible Seattle to learn more.